Item number three on our list of Seven Faith Practices is “read and study the Bible.” Each week we, as a congregation, will be reading one chapter from a book of the Bible. 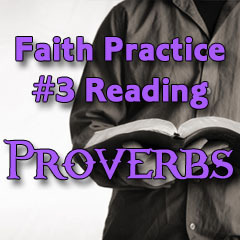 Currently we are reading from the book of Proverbs. The reading schedule is listed below.